to find the code snippet. You have the option to enter the website name and URL, survey timing, and survey frequency. Click on the “Activate survey” button when ready. Once you find the code snippet on top of the setup page, copy and paste it into your web page, just before the closing </head> tag. If your website uses templates to generate pages, enter it just before the closing </head> tag in the file that contains the <head> section. If you have any questions, please read our Help Center article to learn more. We're now offering webmasters an easy and free way to collect feedback from your website visitors with website satisfaction surveys. All you have to do is paste a small snippet of code in the HTML for your website and this will load a discreet satisfaction survey in the lower right hand corner of your website. Google automatically aggregates and analyzes responses, providing the data back to you through a simple online interface. 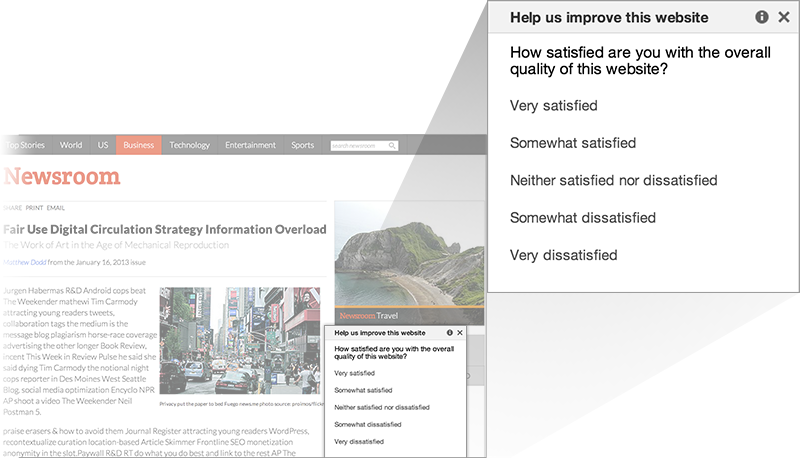 Users will be asked to complete a four-question satisfaction survey. Surveys will run until they have received 500 responses and will start again after 30 days so you can track responses over time. This is currently limited to US English visitors on non-mobile devices. The default questions are free and you can customize questions for just $0.01 per response or $5.00 for 500 responses. To set up the survey code, you'll need to have access to the source code for your website. 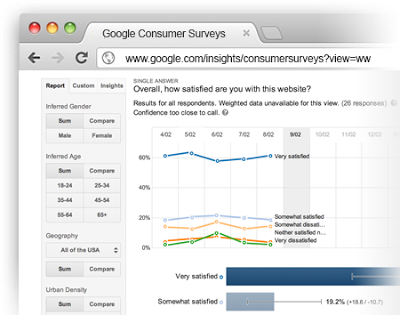 Sign into Google Consumer Surveys for website satisfaction to find the code snippet. If your site violates our Google Quality Guidelines or did in the past, a manual spam action may be applied to your site to prevent spam in our search results. You may learn about this violation from a notification in Google Webmaster Tools, or perhaps from someone else such as a previous owner or SEO of the site. To get this manual action revoked, first make sure that your site no longer violates the quality guidelines. After you've done that, it's time to file a reconsideration request. Should I file a reconsideration request if I think my site is affected by an algorithmic change? Reconsideration requests are intended for sites with manual spam actions. If your site’s visibility has been solely affected by an algorithmic change, there's no manual action to be revoked, and therefore no need to file a reconsideration request. If you're unsure if it's an algorithmic change or a manual action, and have found issues that you have resolved, then submitting a reconsideration request is fine. How can I assess the quality of a site’s backlinks? The links to your site section of Google Webmaster Tools is a great starting point for an investigation as it shows a significant amount of your site’s inbound links. If you know that you ran an SEO campaign during a particular period of time, downloading the latest links can come handy in slicing links created at that time. Using the links found in Google Webmaster Tools, we recommend looking for patterns that point to general issues that are worth resolving. For example, spammy blog comments, auto generated forum posts or text advertisements with links that pass PageRank are likely to be seen as unnatural links and would violate Google’s quality guidelines. For individual examples and hands-on advice we recommend getting help of peers and expert webmasters on the Google Webmaster Forum. How do I clean a bad backlink profile? Make sure to identify poor links first, then make a strong effort to get them either removed or nofollowed. Then use the Disavow Links Tool to deal with remaining unnatural backlinks. We recommend using domain-wide operator for sites with a complicated URL structure, very obvious spam sites, such as gibberish content sites or low quality sites with content that shows no editorial value. See our video on common mistakes when using the disavow tool for more information. How much information do I need to provide? Detailed documentation submitted along with a reconsideration request can contribute to its success, as it demonstrates the efforts made by the webmaster and helps Googlers with their investigation. If you are including a link to a shared document, make sure that it’s accessible to anyone with the link. How long does it take to process reconsideration requests? Reconsideration requests for sites affected by a manual spam action are investigated by a Googler. We strive to respond in a timely manner, normally within just a few days. However, the volume of incoming reconsideration requests can vary considerably, hence we don't provide a guaranteed turnaround time. What are the possible outcomes of a reconsideration request? Upon submitting a reconsideration request, you will first receive an automated confirmation in Google Webmaster Tools. After your request is processed, we'll send you another message to let you know the outcome of the request. In most cases, this message will either inform you that the manual action has been revoked or that your site still violates our quality guidelines. Where can I get more guidance? For more information on reconsideration requests, please visit our Help Center. And as always, the Google Webmaster Forum is a great place for further discussions as well as seeking more advice from experienced webmasters and Google guides. When talking to site owners on Google Webmaster Forums we come across questions on reconsideration requests and how to handle backlink-related issues. Here are some common questions, along with our recommendations. When should I file a reconsideration request? 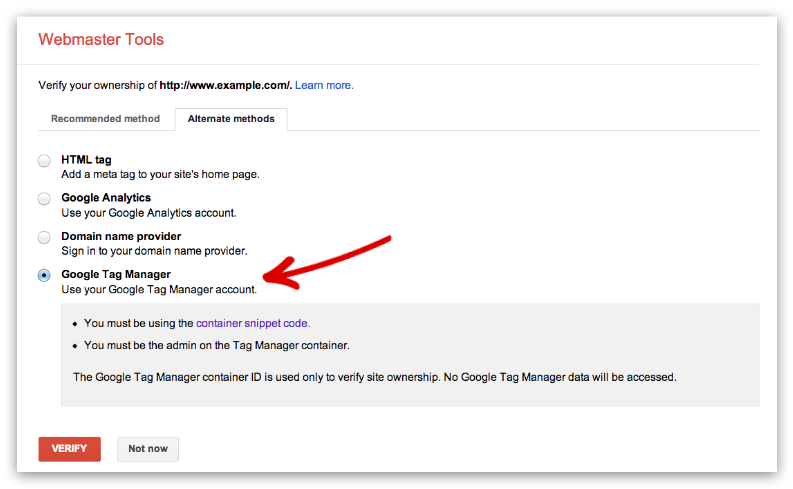 If you use Google Tag Manager to add and update your site tags, now you can quickly and easily verify ownership of your site in Webmaster Tools using the container snippet code. 1. On the Webmaster Tools home page, click Manage site for the site you’d like to verify, then select Verify this site. If you haven’t added the site yet, you can click the Add a site button in the top right corner. To do this, you must have "View, Edit, and Manage" account level permissions in Google Tag Manager. 2. On the Verification page, select Google Tag Manager as the verification method and follow the steps on your screen. If you’ve got any questions about this verification method, drop by the Webmaster Help Forum. Smartphone users are a significant and fast growing segment of Internet users, and at Google we want them to experience the full richness of the web. As part of our efforts to improve the mobile web, we published our recommendations and the most common configuration mistakes. Avoiding these mistakes helps your smartphone users engage with your site fully and helps searchers find what they're looking for faster. To improve the search experience for smartphone users and address their pain points, we plan to roll out several ranking changes in the near future that address sites that are misconfigured for smartphone users. Let's now look at two of the most common mistakes and how to fix them. This kind of redirect disrupts a user's workflow and may lead them to stop using the site and go elsewhere. Even if the user doesn't abandon the site, irrelevant redirects add more work for them to handle, which is particularly troublesome when they're on slow mobile networks. These faulty redirects frustrate users whether they're looking for a webpage, video, or something else, and our ranking changes will affect many types of searches. Avoiding irrelevant redirects is very easy: Simply redirect smartphone users from a desktop page to its equivalent smartphone-optimized page. If the content doesn't exist in a smartphone-friendly format, showing the desktop content is better than redirecting to an irrelevant page. We have more tips about redirects, and be sure to read our recommendations for having separate URLs for desktop and smartphone users. If you recognize a user is visiting a desktop page from a mobile device and you have an equivalent smartphone-friendly page at a different URL, redirect them to that URL instead of serving a 404 or a soft 404 page. Make sure that the smartphone-friendly page itself is not an error page. If your content is not available in a smartphone-friendly format, serve the desktop page instead. Showing the content the user was looking for is a much better experience than showing an error page. Incorrectly handling Googlebot-Mobile. A typical mistake is when Googlebot-Mobile for smartphones is incorrectly redirected to the website optimized for feature phones which, in turn, redirects Googlebot-Mobile for smartphones back to desktop site. This results in infinite redirect loop, which we recognize as error. Avoiding this mistake is easy: All Googlebot-Mobile user-agents identify themselves as specific mobile devices, and you should treat these Googlebot user-agents exactly like you would treat these devices. For example, Googlebot-Mobile for smartphones currently identifies itself as an iPhone and you should serve it the same response an iPhone user would get. Unplayable videos on smartphone devices. Many websites embed videos in a way that works well on desktops but is unplayable on smartphone devices. For example, if content requires Adobe Flash, it won't be playable on an iPhone or on Android versions 4.1 and higher. Although we covered only two types of mistakes here, it's important for webmasters to focus on avoiding all of the common smartphone website misconfigurations. Try to test your site on as many different mobile devices and operating systems, or their emulators, as possible, including testing the videos included on your site. Doing so will improve the mobile web, make your users happy, and allow searchers to experience your content fully. As always, please ask in our forums if you have any questions.